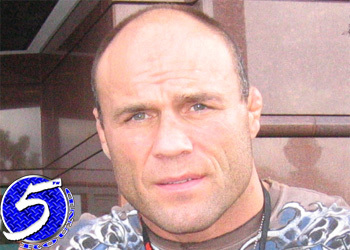 Hours after the UFC announced they had inked boxing legend James Toney to a multi-fight contract, Hall of Famer Randy Couture immediately hit up Twitter to volunteer his services in welcoming the 41-year-old into the violent world of mixed martial arts. “I hope I’m the first guy they call to fight Tony! :),” Couture Tweeted late Wednesday evening. Although “Lights Out” has never set foot inside an MMA cage, he does own a dominant 72-6 professional boxing record, including 3 draws and 2 no-contests. The IBF middleweight, super middleweight and cruiserweight titles have all been wrapped around Toney’s waist at one point in time. Whenever there’s a big fight mentioned in the light heavyweight or heavyweight divisions, “The Natural’s” name will always be thrown on the table. At this stage in his illustrious career, there’s nothing left for him to prove so his talents should be reserved strictly for blockbuster scraps. A Couture/Toney bout would definitely attract massive mainstream attention and could do wonders for legitimizing MMA amongst casual fans. However, someone needs to explain to Captain America how this Twitter thing actually works, otherwise he’s going back to promoting and negotiating fights the old school way. Come on Randy, you’re IT skills aren’t THAT bad. At least you know how to text Smiley Faces! This would be the epitome of a striker vs. grappler matchup if it were to go down, although Couture has been a world class wrestler for decades so we all know what the outcome will be if the soon-to-be 47-year-old is able to get his mitts around Toney and take him to the mat. Toney fans would take the flip-side of that argument and say James has been an elite marksman for 25 years and Couture could end up unconscious before he gets close enough to attempt a takedown.